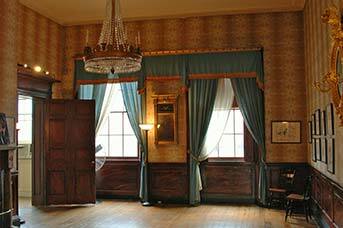 The Carroll Mansion is an exciting back-drop to host your next event. 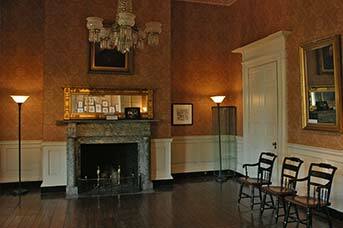 One of Baltimore’s unique and historic treasures, its inviting spaces are ideal for intimate wedding receptions, private celebrations and corporate meetings. Conveniently located in downtown Baltimore, the Mansion is easily accessible from I-83, I-395 and I-95 and offers on-street parking and parking garages in close proximity. The Mansion is in Historic Jonestown, four blocks east of the Inner Harbor and one block north of Little Italy. 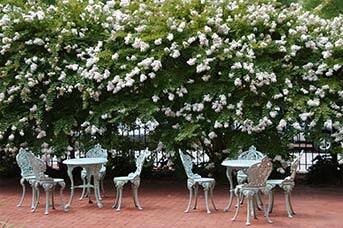 The Mansion’s Garden Courtyard is available for events from May—September. 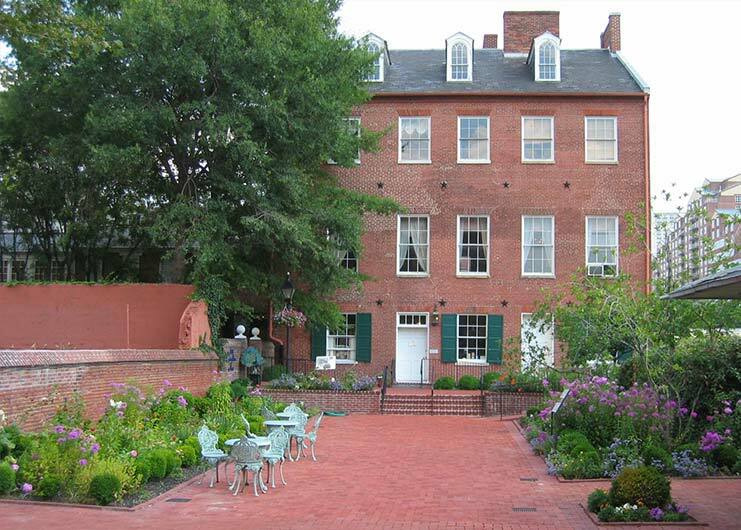 Its surrounding gardens, wide, bricked walk, and elevated porch are a perfect for wedding ceremonies and outdoor receptions. The courtyard accommodates up to 130 people seated. Tenting options are available. 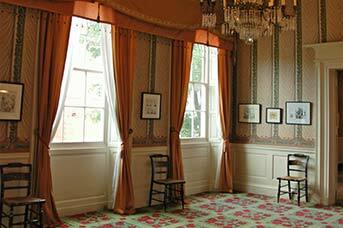 Carroll Mansion is available for rental during normal business hours for meetings, seminars and conferences and after hours for receptions and special events. 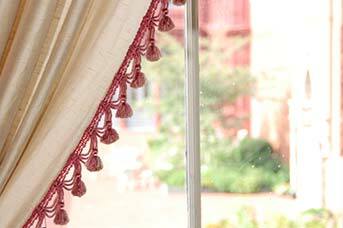 The Mansion has three gracious rooms, the Drawing Room, Dining Room, and the Parlor, for rental en-suite. They will accommodate 80 seated dining style or 150 for a standing reception. See photos and plan below. An impressive grand staircase leads guests to rooms that boast 18-foot ceilings, ornate chandeliers and marble fireplaces. Accommodates 40 seated dining style or 50 theatre style. Accommodates 20 seated dining style or 25 theatre style. 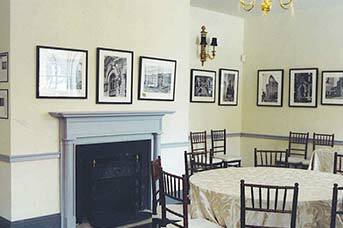 Also available to rent, the Mansion’s Hospitality Room located on the ground floor, hosts the Carroll Mansion Art Gallery. It accommodates up to 30 people, opens onto the Garden Courtyard, and is perfect for meetings and luncheons. For photos of past Carroll Mansion events visit our Event Photo Gallery. Check out our new Intimate Wedding Packages, perfect for events for 30-80 guests. Accommodates up to 30 standing or 24 seated. Accommodates 150 seated or standing. Tenting options are available. Please call us at 410.605.2964 for details. For guests with reserved events at the Carroll Mansion who would also like space for a Rehearsal Dinner: 6pm to 8pm plus 2 hr setup, 1 hr breakdown. All additional fees apply. * Listed fees cover the entire function from initial set up through final clean-up. Indoor and/or outdoor, seating and/or mingling capacity limit is strictly enforced. * Capacity limit does not include catering or museum personnel. * No one room holds 80 people. 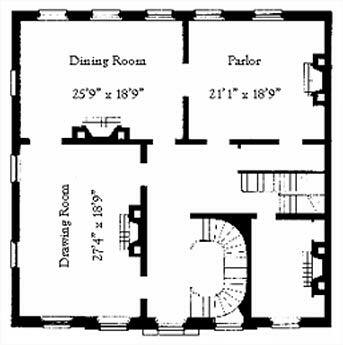 On the second floor, the Drawing room can hold 50, the Dinning room can hold 30, and the Parlor can hold 20. Carroll Museums has a preferred list of caterers. Caterers not listed may still be eligible to operate inside the Mansion for an additional fee. 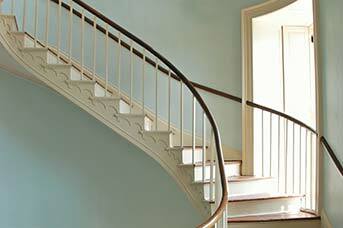 Docent-led tours of the Mansion are available for your guests. A modest fee applies and tours must be arranged in advance. Please contact us for further information, rates and to schedule a tour of our facilities.